J. K. Rowling borrowed an ancient Greek myth of a Three-Headed Dog for Harry Potter and the Sorcerer’s Stone. He was originally known as Cerberus, and he guarded the gates of Hades to keep living people out. 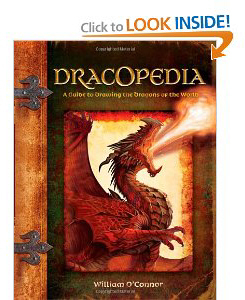 To read more about this ancient mythological creature, go to http://www.loggia.com/myth/cerberus.html. 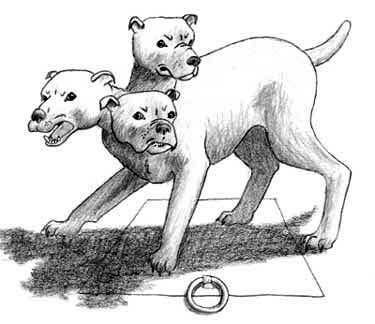 Now, let’s learn how to draw a magical Three-Headed dog! For my picture, I decided to leave off the serpent tail, (or lizard or dragon tail, depending on the telling of the story,) and show Cerberus in his reincarnation as Fluffy. When I started the research for this chapter, I thought it would be easy. Silly me. It did start out easy, anyway. 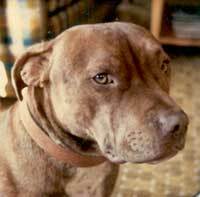 My father, C. K. Havekost, sent me his photo of Toka, an English Staffordshire Terrier who lived with my parents for many years. Toka was a real sweetheart, and had no fierceness in him at all. But I really think he looks the part of the three-headed dog. That’s his picture at the top of the page. Like I said, that was the easy part. Toka does look mildly irritated because someone is taking his picture, but a mildly irritated Fluffy wouldn’t scare anyone away from the trapdoor and the Sorcerer’s Stone, (or away from the Gates of Hell, either). He has to look mean. He needs to be aggressive. He has to show some teeth. Then I tried “dog snarl” and got lucky, and found a great picture on a site from England that showcased puppets used in movies. Unfortunately, that website is no longer available, so you’ll need to search for a picture to use. 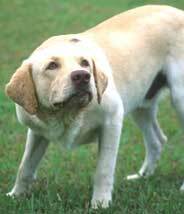 I did read, while doing the research for this chapter, that an angry dog will keep it’s eyes wide open (showing lots of white), unless it’s a wimpy dog. Wimps have squinty eyes when they’re snarling. So I’ve paid lots of attention to the teeth and mouth in the photo, but will draw the eyes open and staring. 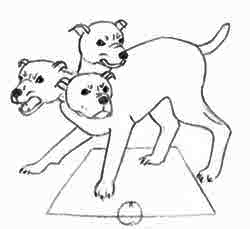 No one ever accused the Three-Headed Dog of being a wimp! It just goes to show you that sometimes the research takes longer than the drawing. But it’s very important to keep looking for the perfect model. It will really make your drawings special. For a body, we can use this crouching dog. And to help us with the different poses of Fluffy’s three heads, I flipped the photo of Toka on my scanner. It will be easier to draw our three heads if we see where the basic proportions are. 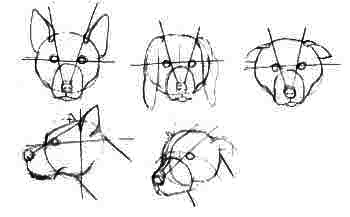 Look at the drawings below, and see how the eyes fall on a horizontal center line, and how we can fix the position of the ears by drawing a line from the nose back at an angle through the eye. This really helps us make our first sketch. 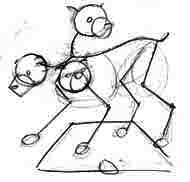 We now begin our final drawing by putting on the outline of the dog’s body. 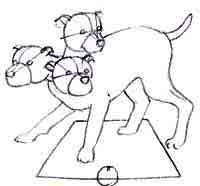 We very quickly find out that the hard part of drawing a Three-headed dog is not putting on the heads, but finding room for all those necks! We’re trying to put three things in a place where one thing really goes, at least in the real world. But if we put two of the necks behind one of the heads, it will look OK. I have occasionally made small clay figures to help me make a drawing come out right, but in this case I decided not to. It’s an option you might keep in mind, though, in case you ever get really stumped with a drawing. I’ve had to make several copies of my drawing, because when I followed my skeleton sketch exactly I found that the heads were too small, and the necks were too long. I traced the body on a clean sheet of paper, then drew the heads again. I think the result is much better. We still have no snarl, no growl, no teeth. It’s now time to go to the website you found with a snarling dog picture. You can open it up on your browser window, then disconnect your Internet connection. That way, if you have a modem connection, you won’t be tying up the phone line too long. We have to decide which head will have the most teeth showing, since we don’t want them all to have the same expression. That would be boring. Since the head on the lower left is closest to the position of the dog in the picture, I picked that one. Ooh, now that’s more like it. All we need now is some shading to make him look more solid, and we’ll be done. All of the photographs we’re using have the light source coming from different directions, so we’ll have to figure out the shadows by ourselves. You men may want to add some drool, tear up a few ears (does he bite himself by accident?) show a little more teeth. This is one that we can really play with. And you might even want to add that serpent tail, to see how what Cerberus looked like. I’ll bet it would be pretty dramatic!